Polaritons are bosonic composite particles that are part light and part matter. They are composed of photons and excitons (electron-hole pairs) forming in semiconductor microcavities in the strong light-matter interaction regime. Akin to ultracold neutral bosonic atoms, polaritons can undergo Bose-Einstein condensation. In a Bose-Einstein condensate (BEC), millions of bosons occupy a single quantum mechanical state and display collective quantum behaviour, thus bringing the quantum physics onto the macroscopic scale. A BEC is one of the most sensitive and controllable quantum systems. It has applications ranging from precision measurement sensors and metrology standards, through to tests of the fundamentals of quantum mechanics. The polariton BEC bears many similarities to the acclaimed BEC of neutral atoms which forms at temperatures within a millionth of a degree of absolute zero. However, and most remarkably, a polariton BEC can be obtained at both cryogenic and room temperatures in a solid state. This transfers the amazingly rich and technologically promising physics of condensates from a fragile gaseous state in an ultra-cold and ultra-high vacuum environment, typically only found in state-of-the-art experimental laboratories, to a very accessible level. Moreover, due to their semiconductor nature, polaritonic devices could be readily integrated into conventional electronic circuits. Observation of the first polariton BEC in 2006 has prompted the emergence of polaritonics – a new field of optoelectronics that employs collective quantum effects in solid state, cost-effective devices. Our group is actively involved in studies of exciton-polariton BEC formed in high-quality III-V semiconductor microcavities hosting GaAs quantum wells. Recently atomically-thin, two-dimensional layers of transition metal dichalcogenides (TMDCs) have emerged as a new platform for hosting excitons with large binding energies, which survive up to the room temperatures. 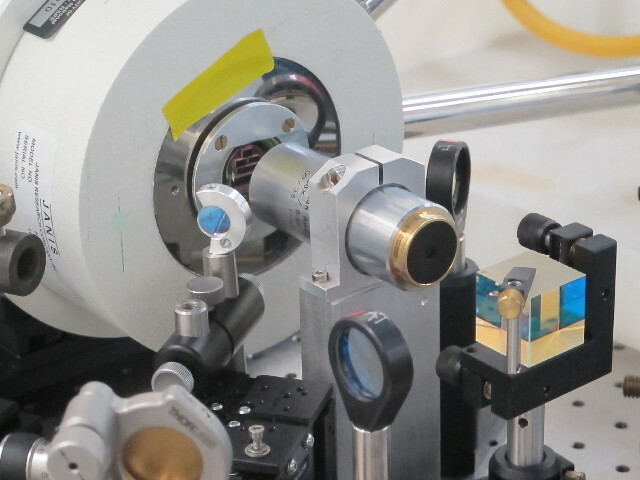 As part of the ARC CoE FLEET, we aim to engineer optical microcavities with embedded TMDC monolayers for studies of exciton-polariton phenomena. Our ultimate goal is observation of exciton-polariton condensation and superfluidity at room temperature enabled by these novel semiconductor materials. Schematics of creating and imaging a polariton condensate in a semiconductor microcavity. Photoluminescence from the cavity, collected by a microscope lens, carries all information about the structure and quantum properties of the BEC (image courtesy of Dr. Michael Fraser, RIKEN). Semiconductor microcavity samples are mounted on the cold finger of the microscopy cryostat and cooled down to ~10K. A high NA objective is used to collect the microcavity photoluminescence which is analysed to extract information about the polariton BEC. Polariton BEC can be manipulated by structuring the optical pump. 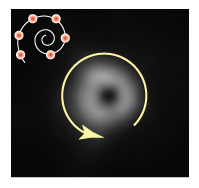 This is an image of a vortex created by a six-spot 'spiral' pump that breaks the chiral symmetry.